It's not really a Duterte dictatorship that Yellowtards fear but a looming Macapagal-Marcos political alliance. 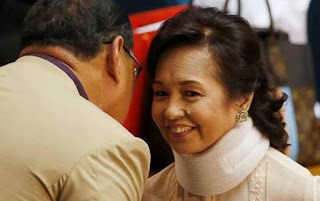 The scions of Cong Dadong and Apo Lakay are on a mission of redemption. They want history to be kinder to their respective plights. In the case of GMA, she wants to be remembered as the President who did more for the country post-Marcos and not the President who replaced Erap in a civil-military coup. She also wants to remove the ignominious circumstances of her detention for five years on trumped up charges. In the case of Bongbong, the Marcoses have been enjoying a renaissance already. Nothing would validate this more than a return to Malacañan as President or Prime Minister depending​ on the outcome of the move to amend the Constitution. Should the alliance come to fruition, the Yellowtards and their minions will be confined to the political dustbin of history. We want constitutional authoritarianism from FM. We want authoritarianism not democracy. We want discipline not freedom.